The Breakdown: Will Torture Memo Authors Evade Justice? In 2002, the Department of Justice's Office of Legal Counsel, at the behest of the CIA and in conjunction with the White House, drafted a memo on acceptable standards of interrogation. Now the authors have been cleared of wrongdoing. In 2002, the Department of Justice’s Office of Legal Counsel, at the behest of the CIA and in conjunction with the White House, drafted a memo on acceptable standards of interrogation. The OLC’s opinions, authored by then-Deputy Assistant Attorney General John Yoo and approved by his supervisor Jay Bybee, provided a legal framework for the widespread implementation of cruel and inhuman enhanced interrogation techniques used under the Bush Administration. Since the memo’s public release, human rights organizations, independent legal bodies and intelligence officials have all condemned the document and demanded professional sanctions for Yoo and Bybee. After five years of investigation, the Office of Professional Responsibility recently released a report effectively clearing Yoo and Bybee of misconduct. 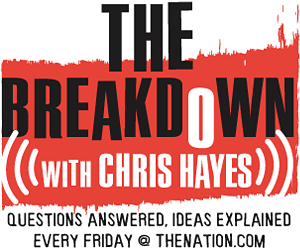 On this week’s The Breakdown, The Nation‘s DC Editor Christopher Hayes, with guest Marcy Wheeler from Firedoglake, discuss the layers of the OPR report and its implications. Marcy Wheeler’s blog, Empty Wheel. Official text of the Bybee memo. Documents from the Department of Justice relating to the OPR report. Foreign Policy brief on OPR findings. Editor’s Note: Starting this week, The Breakdown is being produced in partnership with ExplainThis.org, a new website devoted to explanatory journalism. Visitors to the site can post questions, which are sorted and ranked, and then answered by journalists. ExplainThis.org has set up a special page for The Breakdown, so you can now ask Christopher Hayes your questions via email, twitter or online–at ExplainThis.org/thebreakdown.